Struggling through three years of a pointless sociology degree in the 1960s destroyed my enthusiasm for most literature. It was my misfortune to study the subject when it was masquerading as a science supported by the most turgid text books known to man. It was an aversion therapy that ‘cured’ me of reading anything longer than a newspaper article – especially novels. I had hoped on retirement I would re-kindle an appetite for reading novels, which had been a passion in my years before college. I reasoned I should ease myself back slowly as I sought to resume reading for pleasure after a gap of 30 years. My early forays were successful. I commenced on the journey of re-discovery with dear Sherlock Holmes and old favorites A Study in Scarlet and The Sign of the Four. This prompted me towards more substantial tomes – Emma and Great Expectations – which I knew well enough about but had never actually read. These too were a success. Life was too short, I reasoned, to catch up on all the missed classics, while contemporary fiction was too expensive to buy in bookshops. So I left it to chance and my local library to provide me with a supply of modern British authors. I chose the writer and took whatever was on the shelves. This is how I came to take home in successive weeks The Information by Martin Amis, Ian McEwan’s Saturday, and The Act of Love by Howard Jacobson. I found they all had one thing in common – they were unreadable. Abandoning anything other than the bare bones of plot on which it to hang character studies of middle-aged, middle class men in crisis, Reader, nothing very much happened. It was a struggle to care enough to get to the end of each work. Fast-forward to last weekend. My local Morrisons supermarket has just introduced a bin of paperback thrillers marked down to £1.99 each ($3.21) or three for £5 ($8.06). 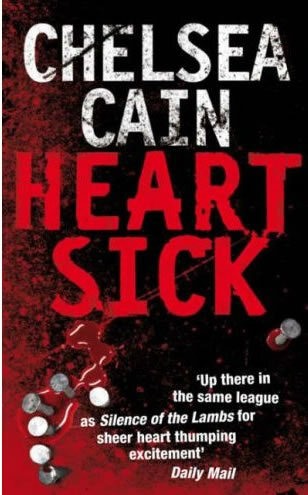 I threw Heartsick by Chelsea Cain into my trolley. With a back cover blurb that included a sentence beginning “When beautiful serial killer…” I had no intention of reading the book. Rather I intended seeing how popular airport fiction was put together. What tense the author wrote in, how many characters’ point of view were employed, what proportion of text was dialogue etc. You’ve probably guessed that once I started reading the book I couldn’t put it down. Gore is not my thing but I polished off the 400 pages in two days. I was swept along by the sheer pace of the storytelling. Once finished glaring holes began to appear. The willing suspension of disbelief was stretched too far. So I’m not recommending the book – any of the thrillers in the discount bin might have had the same effect on me. But I can tell you unlike Amis & Co while reading Heartsick I never forgot who any of characters were and their relationship to one and other. Just as importantly when ever I returned to the novel, I knew where to pick up reading without the need for a bookmark. With my modern Brits I could read for pages before I realised I had already done so such was their lack of impact on my memory. All is not lost. I got Arthur & George by Julian Barnes (back with Sir Arthur Conan Doyle, you see) from the library yesterday – and that already looks a winner because, well, stuff happens. Do you think that the pace of moern life and of the moving image has affected our ability to deal with slow paced introverted literature?